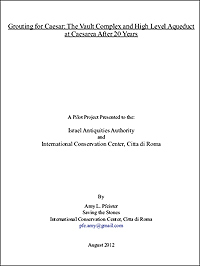 many such projects in Israel and abroad, its conservation project has yet to publish a final report. and related professionals around the world. analyzes the grouting method implemented at the Vault Complex and High Level Aqueduct. projects is also a vital source of information. monitoring over an extended period of time.